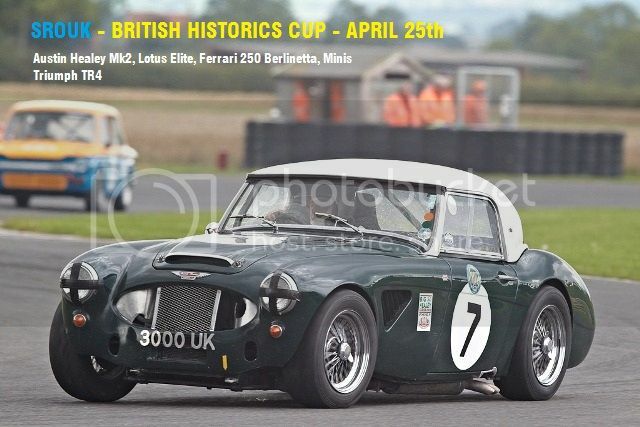 Cars allowed: Triumph TR4, Austin Healey 3000 MK2, Ferrari 250 Berlinetta, Mini Cooper (ALL), Lotus Elite. Excessive cutting of corners will seen as cheating and the results may be altered to reflect that. Splendid, I must be getting good at this. If you wanna make the race 40 minutes long, I believe you need to make it 24 laps. I have downloaded this and turned a few practice laps but then realised I'll be away at a conference next Thursday - no race for me this week either! Berlinetta might have been a nice car if they had fitted brakes to it! Have to start dragging my foot on the track before the marker posts are even visible! Took me twenty minutes of practice before I could complete an out lap with a healthy car! Yeah, and the extra hard tires don't help much. Has a great-sounding engine though. Means that I can set the tyre and fuel multiplyer to times anything but five and do an exact simulated race distance. EDIT: Mind you, the tyres on the Ferrari would probably still be street legal if they ran from now until the same time next year! errrr..........the tarmac outside the white line between Jim Clarke Esses and Barcroft. .............. is it available for use or not? I find that the Ferrari needs all of it and the Lotus doesn't need any! is track surface unless it means crossing a kerb when it needs a local ruling. I will have a look later, but I would not expect to impose a limit. over it before the kerb it's more of a "run off area" than anything else. Page created in 0.227 seconds with 66 queries.